We have many great things to say about this Deering banjo. With it's beautiful mother of pearl inlays and ebony fingerboard, this instrument is sure to draw attention. The Boston 6 String banjo is tuned like a guitar so guitar players can instantly start playing this type of banjo. It has big resonant bass notes that you don't find on a 5-string banjo, and also crisp highs for that beautiful banjo tone. Finally! A banjo that can be played at any volume. The new Sierra Acoustic/Electric banjo features the factory installed Kavanjo banjo head pickup system. The Saratoga Star is one of the most elegantly beautiful modern banjos to enter the musical arena of classic instruments. With Kruger Bronze Tone Ring. Our top selling 6-string banjo - now as an acoustic/ electric model. 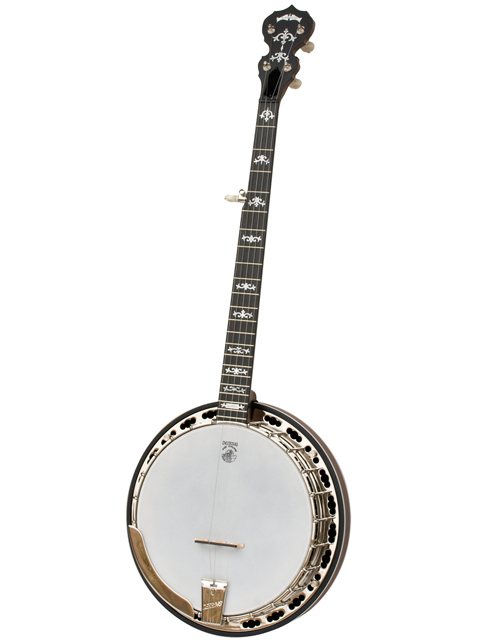 Taylor Swift uses this banjo on her Grammy award winning song "Mean". Banjo.com is pleased to bring you the best selection of Deering professional banjos in the world. We stock many high-end models that most other dealers do not. Deering banjos are 100% American made by banjo enthusiasts, Greg & Janet Deering, in the state of California. Since the 1970’s they have been perfecting their art of banjo making, starting by selecting the finest woods. We stock popular models like the Deering Sierra and Deering Calico. We offer free express shipping on all Deering banjos and free professional setup. All Deering banjos include a hard-shell case with purchase. Deering is so confident in their craftsmanship that they offer a lifetime warranty with every instrument. We sell hundreds of their products every year and never have any issues, these banjos are some of the best quality instruments available. Our banjo experts are available to take your call or answer any questions submitted through our contact page.